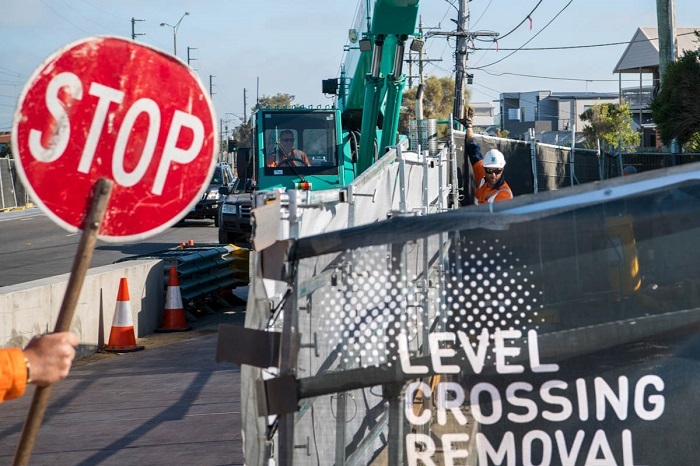 Carrum is set to receive a brand-new town hub, with works to remove 3 dangerous level crossings now underway. The works include a new station at Carrum, as well as a new open plan community space which will allow for easier access to the waterfront. Crews, including BDS Civil and Construction, are now relocating unground services such as gas, water and power in preparation for new structures including a 900-metre rail bridge. A temporary track will soon be laid to reduce commuter disruption while the old track is being removed. The rail bridge and new station will be open in early 2020, with work continuing on the Carrum revitalization. This work will see more than 1.2 hectares – equivalent to the size of two soccer fields – of new community space created, transforming the area. The new rail bridge will also make for a safer commute and lessen current peak hour congestion along Nepean Hwy. The new revamp of Carrum will include a new foreshore playground, a green village and Carrum shops, a town square and station garden at the second entrance to the station nears Walkers Road. Access to local shops will be maintained throughout construction, and the project is encouraging the Carrum community to continue to support local businesses by shopping locally. All works to complete the pedestrian and bike ramps on the Karrum Karrum Bridge and paths along the river will be done by April. The ramp on the Bonbeach side of the river will be open by late February with the ramp on the Carrum side open in April. The bridge was opened months ahead of schedule in September last year. Our Mission: To improve, expand, and upgrade civil and rail infrastructure for a safer and enhanced public transport system.